Do Subjective Preservation Standards Trump Objective Zoning Standards? - Ward and Smith, P.A. Do Subjective Preservation Standards Trump Objective Zoning Standards? Numerous North Carolina municipalities and counties have established historic preservation commissions ("HPCs"). Pursuant to N.C. Gen. Stat. Chpt. 160A, Art. 19, Part 3C, HPCs are tasked with creating and implementing guidelines to preserve North Carolina's historic landmarks. Historic preservation guidelines are to be based on the local architectural vernacular, and the statutes require that HPCs use these guidelines when issuing or denying certificates of appropriateness for proposed exterior changes to structures located within a historic district. Because these guidelines are generally more restrictive than applicable zoning regulations, the question often arises as to whether the often-subjective guidelines established by an HPC govern over the objective criteria set forth in a zoning ordinance. This issue was addressed recently by the Court of Appeals in Sanchez v. Town of Beaufort, 710 S.E.2d 350, pet. for cert. denied, 365 N.C. 349, 717 S.E.2d 745 (2011). Based on the facts in that case, a lower height requirement was found to be arbitrary and capricious and invalidated. The outcome may have been different, however, if the Beaufort Historic Preservation Commission ("BHPC") had relied upon specific guidelines or principles to support a lower height limitation. The Petitioner, Gerharda H. Sanchez ("Sanchez") lives on Front Street in the Historic District of Beaufort, North Carolina, and is a former member of the BHPC. From her front porch, Sanchez has views of Carrot Island and Taylor's Creek. Across the street from her home was a 16-foot two-inch tall structure known as the "Carpenter Cottage." Douglas E. Smith ("Smith") purchased the Carpenter Cottage with the intent to demolish it and construct a new two-story structure in its place. Because Smith's property is located in the Beaufort Historic District, he was required to submit applications to the BHPC for certificates of appropriateness ("COA") before he could commence demolition and construction. On March 14, 2009, Smith submitted an application for a one-and-a-half story structure that was 29 feet tall. Although the BHPC approved the demolition plan, Sanchez and other members of the community objected to the proposed height. Sanchez and her husband testified that the obstructed view would reduce the value of their home by $100,000 to $150,000. The BHPC voted to deny the construction application because the proposed house would exceed 24 feet, a height the BHPC had previously found to be acceptable. Smith appealed to the Carteret County Superior Court, which found the BHPC's height limitation to be arbitrary and capricious and ordered the BHPC to issue the COA. Once the BHPC issued the COA, Sanchez appealed the decision to the Superior Court. Ultimately, both the Superior Court and the North Carolina Court of Appeals upheld the issuance of the COA. Although the Historic Preservation District statutes (N.C. Gen. Stat. Chpt. 160A, Art. 19, Part 3C) appear to give an HPC complete control over the quasi-judicial approval process, the Court of Appeals in Sanchez found that the discretion of a HPC is limited to preventing construction which would be "incongruous with the special character of the landmark or district." (Emphasis added). Id; A-S-P Assocs. v. City of Raleigh, 298 N.C. 207, 222, 258 S.E.2d 444, 454 (1979) (Preservation limitations are "a contextual standard" that must be based on the "total physical environment of the Historic District"). In applying this standard to the facts in the Sanchez case, the Court of Appeals held that "the whole record [did] not contain substantial evidence that would support the BHPC's determination that Smith's proposed new construction was not congruous with the rest of the historic district because it exceeded 24 feet." Sanchez, 710 S.E.2d at 354. The court found that the evidence in the record clearly showed that structures in the Historic District ranged between 20 feet and 35 feet in height, that the closest structures to the proposed building ranged from 26 feet to 35 feet in height, and that the height limitation established by the BHPC was based on personal preferences of the members and not specific guidelines or rules established by the BHPC. On appeal, Sanchez attempted to argue that the BHPC's denial of Smith's application should have been upheld because the proposed building violated guidelines protecting the Historic District's views or "vistas," but the court rejected this argument because the record clearly showed that the denial was not based on any guidelines and that members of the BHPC had stated that the views or "vistas" would be obscured even at the lower height of 24 feet. This section of the opinion, however, begs the question: Would the result have been different if there had been evidence in the record that the BHPC considered and based its decision on specific guidelines and policies established by the BHPC? Chapter 5 of the BHPC's Guidelines ("Guidelines") states that several viewscapes, including views from houses along Front Street, are so critical to Beaufort's maritime setting and historic character that they should be preserved. In keeping with this guideline, the BHPC developed a policy that "new construction…that encroaches into the vistas of Beaufort's waterfront should be permitted only to the extent necessary to allow reasonable use of the property. 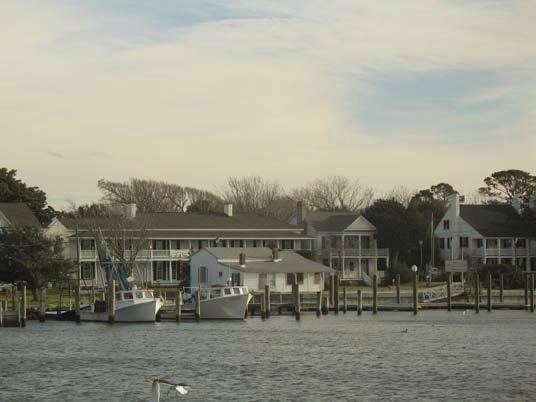 In weighing the impact of new construction…, the commission should consider the traditional setting or context of the subject property relating to the vistas of Beaufort's waterfront." (Emphasis added). Further, Guideline 7.2.5 states that if a contributing building is demolished, the replacement building should be designed to be of "similar height, scale, massing and location as the previously existing building," (Emphasis added) and that an applicant will have a "heavy burden" to overcome the presumption that a "replacement structure with different height, scale, and massing as the previously existing building is incongruous [sic] with the Historic District." In addition to the Guidelines, the North Carolina General Statutes provide that whenever a historic preservation ordinance "imposes higher standards…than are established under any other statute, charter provision, or regulation," the higher standard established by the preservation ordinance shall govern. N.C. Gen. Stat. § 160A-400.10. Had the BHPC specifically referred to these statements of policy and limited the height of Smith's proposed building to a height similar to the structure to be demolished (16 feet), the Court of Appeals may have reached a different conclusion in Sanchez. The Carpenter Cottage is the single-story structure in the center of the photograph, and the Sanchez home is located behind the trees on the left edge of the photograph. This photograph is from the Beaufort Historic Design Guidelines. The Sanchez case highlights potential problems that can arise when HPCs adopt contextual standards that impose greater restrictions on the use of property than the objective standards imposed by zoning ordinances. Ultimately, the lesson learned from the Sanchez case is that subjective standards or guidelines established by an HPC can govern over objective criteria set forth in a zoning ordinance if they are referenced in the record and supported by the facts of the case. Published in the North Carolina Bar Association's Land Use Law Quarterly﻿, Volume 7, Number 4, June 2012.